North America Sheet II Lower Canada and New Brunswick with Part of New-York, Vermont and Maine. 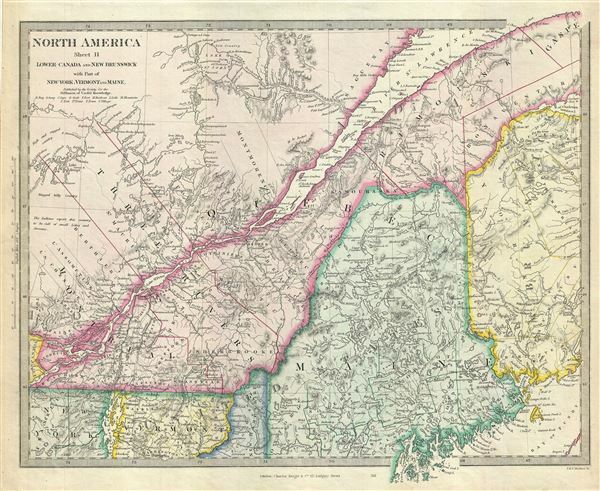 This is a lovely 1848 map depicting Quebec, Canada and Maine, United States, issued by the S.D.U.K. Parts of New Brunswick, Vermont and New York are also included. Centered on the St. Lawrence River, it covers part of Quebec or Lower Canada from Vaudreuil to the Chaleur Bay and south as far as Penobscot Bay. Includes Montreal, Quebec City and the St. Lawrence Valley. In Canada, the map includes several interesting notes, such as, 'The Indians report this country to be full of small Lakes and Streams,' 'Rugged and Hilly Country' etc. Canadian provinces and territories were under British and French control from the 16th century, until France gave up its claims in the Treaty of Paris in 1763. In 1791, under the Constitutional Act, the Province of Quebec was divided into Upper and Lower Canada, until in 1841, it Lower Canada was united into the Province of Canada. Canada would remain a collection of British colonies until its confederation in 1867, when the British Province of Canada was divided into Quebec and Ontario and the British colonies of New Brunswick and Nova Scotia incorporated as Canadian provinces. Rumsey 0890.129 (1832 edition). Phillips (Atlases) 794.